Rookie right winger Joe Kocur, just called up by the Detroit Red Wings, has undergone surgery to treat an injury to his right hand, the NHL club announced yesterday. Dr. Richard Singer placed drains in Kocur’s right hand to rid his arm of infection called cellulitis that spread to his elbow. Kocur received a 20-stitch cut Sunday night in a fight with Nova Scotia’s Jim Playfair during a game with Detroit’s Adirondack AHL farm club. The 20-year-old was due to remain in hospital for three to five three to five days. In 38 games for Adirondack this season, Kocur had eight goals, six assists and 161 minutes in penalties. He was called up because of injuries to several Detroit players but had seen no action because of his own injury. Edmonton Oilers called up goaltender Daryl Reaugh yesterday from Kamloops Blazers of the Western Hockey League. DETROIT (AP) – Detroit Red Wings have recalled right-winger Joe Kocur from their Adirondack farm club in Glens Falls, N.Y., the National Hockey League team said yesterday. Kocur, 20, was the NHL team’s sixth-round draft choice in 1983 and was recalled Jan. 7, but underwent surgery for an infected hand on Jan. 8 and was sent back to the American Hockey League club on Jan. 20. In 46 games with the farm team this season, he scored 12 goals, added six assists and collected 171 penalty minutes. If you didn’t already know it, a quick glance at Kocur’s hands would show that he’s more of a fighter than a scorer. The knuckles are covered with scrapes from being bounced off heads and helmets, the most recent abrasion being acquired on Saturday night when Kocur kayoed the Quebec Nordiques’ Randy Moller. It’s almost not who’s injured with the Wings, it’s who is not. One is Adam Graves just back from Moscow with gold in his eyes and he’s been hauled back up from the Spits to the Wings on an emergency basis . . . Having five, maybe six, right wingers not available borders on the catastrophic. They include Dave Barr, Tim Higgins, Brent Fedyk and Mark Kumpel (injured), Joe Kocur (sore hands) and Bob Probert (suspended) . . . Also among walking wounded are Adam Oates, Steve Chiasson, Doug Halward and goalie Greg Stefan, although Oates and Chiasson are close to returning. Kocur received a match penalty from referee Terry Gregson after earning a verdict in a spirited scrap with Boston’s tough guy Jay Miller. It seems Miller came out of it with some damage and Gregson alluded to the protection worn on one hand by Kocur as the cause, a violation of the rules. At any rate, Detroit’s protectors are two-for-two in recent fights but 0-for-two in the committee room. The NHL’s Brian O’Neill will rule today regarding any further punishment for Kocur. O’Neill is also expected to decide whether Bob Probert’s three-game suspension from a game misconduct in Chicago Sunday will be lessened. CHICAGO — Chicago goaltender Alain Chevrier was placed on a liquid diet Wednesday because of a sore jaw, courtesy of a left jab from Detroit Red Wings’ enforcer Joe Kocur for which Blackhawks’ coach Mike Keenan threatened retaliation. Keenan accused the Red Wings of deliberately trying to injure Chevrier in their Stanley Cup series, which resumes tonight with Game 6 here. Keenan cited incidents in Game 2, when Kris King bumped Chevrier as the goalie was trying to play the puck, and in Tuesday’s Game 5, when Kocur reached out with his right hand as he was being checked by Steve Thomas and knocked Chevrier to the ice. Chevrier sat on the ice for several minutes as trainer Mike Gapski administered aid, and Kocur and teammates fought off several Hawk aggressors who went after Kocur behind the net. Kocur was given a two-minute penalty for high-sticking. Chevrier finished the game and Wednesday his jaw was X- rayed. Films indicated nothing was broken, but he had trouble chewing, so doctors put him on a liquid diet. 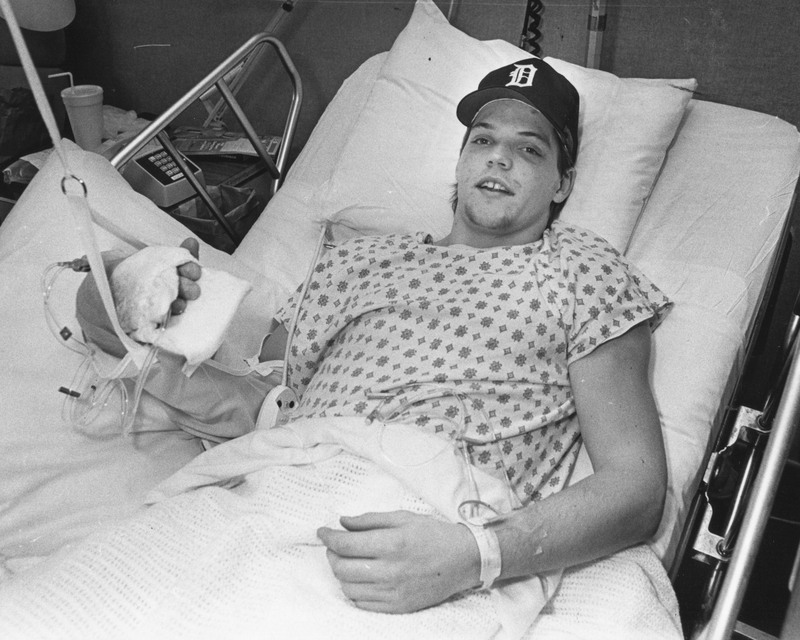 The question around the league is whether last year’s spectacular slugfest with Detroit thumper Joey Kocur will deter him. Kocur hit Kyte with a punch so hard that it broke Kyte’s helmet — and knocked him out. Say hello, politely, to Joe Kocur, whose primary talent is punching people. To some rinkside observers, Kocur (rhymes with no, sir) is the best goon in hockey. Not the best scorer. Not the best skater. Not the best checker. No, the best goon, meaning the best enforcer, the best tough guy, the best attack dog. Don’t dare mess with his Ranger teammates or Coach Roger Neilson will take Pal Joey off the leash. Ever since Tuesday’s trade, the Rangers have attempted to portray Kocur as a right wing who can score goals. With the Red Wings last season he had 16, but he was often skating on a line with Steve Yzerman, one of the N.H.L.’s sharpshooters. During his four previous seasons with the Red Wings, he was on a treadmill as a scorer, producing only 9, 9, 7, and 9 goals. Kocur opened this season with five goals in his first 23 games. But through his brief Ranger debut Thursday, he had not scored in 30 games. Like most goons, Kocur is known for his rap sheet instead of his scoresheet. Among hockey fighters, he is arguably the most lethal puncher, especially with his right hand. He has registered a hockey knockout. He has smashed other players’ cheekbones and noses. He has been suspended for stick-related incidents. He has been in the penalty box for more than 28 hours. Without someone like Gillies, the Rangers believed they needed someone like Kocur, whose 26-year-old hands are already battered from his brawling. With most athletes, the legs go first. But with hockey goons, the hands go first. In their wild-swinging brawls, their hands smash into the other player’s helmet or sometimes into the glass atop the boards. When Kocur stared at his chest X-rays Thursday night in Quebec City after he had difficulty breathing in his Ranger debut, he was baffled. According to Dr. Howard Chester, a Ranger physician, Kocur had a slight muscle tear in his chest wall after coughing frequently in recent weeks because of a bronchial ailment. Apparently nothing serious. But when Kocur departed during the second period Thursday night, Ranger historians shuddered. Three seasons ago, the Rangers acquired an anticipated enforcer in Chris Nilan, but in his third game the husky defenseman suffered a damaged knee. Nearly two decades ago, they acquired another enforcer, Jim Dorey, who separated a shoulder in his first game and never played for the Rangers again. Now, with the Stanley Cup up for grabs among several teams this year, the Rangers rented the goon they think they need. But maybe Joe Kocur isn’t as tough as the Rangers think. Just coughing, he tore a chest muscle. Wait until the other goons around the N.H.L. hear that. Kocur is a fearless winger with thunderous hands who once knocked out Jim Kyte in a fight. He also sent Brad Dalgarno of the New York Islanders into a one-year retirement after breaking his orbital bone with a punch. The hand is an open wound, scarred and oozing around the knuckles, but Joe Kocur said his right fist can still be closed for business. So Kocur will continue to play a sport with a very different agenda, one that other teams dread more than soft ice or Brett Hull slap shots. He will be called a thug, and a goon, but opponents will yield some extra skating room to him and his teammates. His mother, Rita Kocur, will be watching on satellite cable from Kelvington, Saskatchewan. She will close her eyes sometimes, because Rita Kocur can never bear to watch her son fight. She always has something else in mind. At least he once did. Nobody is sure anymore if he still can, with that hand. Back in Kelvington, Rita Kocur bristled at the word “goon,” and said she hoped her son would never fight again. She used to go to some games in Detroit, where she sat down during the fights while everyone around her stood and shouted for blood. Kocur’s loyalty to employers has earned him two big fans in New York. He was coveted by the Rangers’ general manager, Neil Smith, former director of scouting for the Red Wings, and by the Rangers’ assistant coach, Colin Campbell, a former assistant with Detroit. Both men knew that Kocur’s hands were a mess and that he was taking some bad penalties recently with his stick. Both still wanted him. You think repeatedly beating rival hockey players about the head and face without so much as a glove to protect your knuckles doesn’t take its toll on a man’s fist? Just ask JOE KOCUR, the notorious enforcer the Rangers acquired from the Detroit Red Wings late last season. Yesterday the Rangers said Kocur had undergone surgery to repair damage to the knuckle below the middle finger of his right hand, the very one Kocur has used to knock out rivals throughout his career. Kocur is one of hockey’s most vicious fighters, with a right-hand punch that has maimed foes and knocked some unconscious. Kocur injured his right shoulder last January and played in a weakened condition until the team won the Stanley Cup in June. When a summer of therapy failed to heal the shoulder, he and the team’s medical staff decided this week that he would undergo arthroscopic surgery on Friday to remove bone spurs around the rotator cuff. Kocur, 29, has played three full seasons with the Rangers and part of one before that. He broke in with Detroit in 1984-85. Although he has scored only 68 goals in 592 regular-season games, he has also accumulated 2,131 penalty minutes, many of them for fighting. Fighting is technically illegal in hockey and is usually punished with a five-minute major penalty, but it is tacitly allowed by officials and often implicitly encouraged by teams, who employ one or two players on their rosters primarily for this purpose. Kocur, whose hands have been damaged and surgically repaired because of frequent punching injuries, is among hockey’s best at his task, having knocked several foes unconscious. Last winter in Detroit, he fought and defeated Bob Probert of the Red Wings, unofficially considered the league’s fighting champion. Kocur’s current injury was sustained not in a fight, but while checking in a game against Montreal. The Crash Line has been one of the good things for the Devils in these days of distress, but Coach Jacques Lemaire broke up the line of Bobby Holik centering for Mike Peluso on the left and Randy McKay on the right for last night’s meeting with the Rangers. The move backfired. Lemaire scratched Peluso, the team’s best pugilist, in favor of Reid Simpson, who is a fighter like Peluso and McKay, but has yet to prove himself with his fists. Simpson’s career as a battler took a turn for the worse last night. The Rangers’ Joe Kocur, a longtime tough guy, decked him just 5 minutes 5 seconds into the game and Simpson missed the balance of the 1-1 deadlock at Madison Square Garden. Lemaire said after the game that Simpson hurt his right shoulder as he fell to the ice. The extent of the injury was not immediately known. Bowman, widely considered as cold as he is brilliant, was animated as he chatted with players and other guests and was one of the last to leave. Joey Kocur, who has built a reputation as one of the NHL’s toughest customers and has scarred fists to prove it, held hands with his mother as he escorted her to a car.